Who is Tommy Hicks & what is the End-Times Vision of the ‘Sleeping Giant’? Home › Line of Fire › Who is Tommy Hicks & what is the End-Times Vision of the ‘Sleeping Giant’? The bible often describes false teaching and practices in the church as leaven that destroys a good lump of bread. This could be said for the ministry of Tommy Hicks. Looking back in church history, many will wonder who Tommy Hicks was. Hicks played quite a minor role in North America regarding the development in the New Order of Latter Rain cult. However, his ‘insignificant’ ministry is responsible for creating some of the worst heretics, hirelings, false apostles, ministries and revivals ever seen. This article will look at some of the most prominent features of his ministry. HIS INVOLVEMENT WITH THE LATTER RAIN & FGBMFI. Tommy Hicks appeared to be influence by the New Order of the Latter Rain (NOLR) through his friend Demos Shakarian. Back in the early 1950s Shakarian was rubbing shoulders with and befriending NOLR apostles Clayton Sonmore, Georg Warnock and NOLR teachers like William Branham, Oral Roberts to help start up a prosperous NOLR preaching network that could financially support the NOLR teachings. Shakarian called this financial group Full Gospel Business Men’s Fellowship International (FGBMFI). The name says it all, as it was all about promoting the false gospel of the NOLR that they called by many names – in this case, the ‘Full Gospel’. The Full Gospel originally emphasised believers can receive full body healing and experience supernatural revival encounters with the Holy Ghost. This false gospel in the 1950s that birthed the Voice of Healing Movement (VHM) was the ‘carrot’ to draw huge crowds (we see this today in Benny Hinn/Reinhardt Bonnke crusades and Bethel-style churches). It was certain preachers (those who were part of FGBMFI such as Oral Roberts, Kenneth Copeland, Kenneth Hagin, John Osteen and Morris Cerullo just to name a few), who then spun the meaning of ‘fullness’ to include material prosperity. Thus the birth of the Health and Wealth and Word of Faith cults. Images and information from FGBMFI. “Demos also believed that Christians filled with the Holy Spirit received visions and promptings from God, including direct messages. Before looking at Tommy Hick’s exploits in Argentina, it is worth looking at a vision he claimed to receive in 1961 often to referred as the Vision of the Sleeping Giant. The sleeping giant is none other than a giant Jesus made up of believers, literally interpreting the body of Christ (the church) to be the actual body of the Christ. This vision highlights the effects the NOLR heresy had on his ministry. To many old school Charismatics and NOLR/NAR folks, this vision was a sign of the coming of the end of the church age, that Christ was to be fully formed in his Church as the “man-child,” taught earlier in the NOLR Revival in 1948-51. This is due to the fact that this vision was also called the ‘End-Times Vision‘ and is treated as an infallible prophecy like the Vision of the Waves by Lorren Cunningham (1956), the Seven Mountain Mandate by Cunningham and Bright and the Billion Soul Prophecy by Bob Jones. The kenotic Christ. He is just a man like us operating with power in his hands. These Latter Rain doctrines are linked to the Mormon (Latter Day Saints) heresy of Exaltation – where to become one with Jesus as Jesus is one with the Father, we can be exalted as gods like Jesus was. So we are entertaining a name of these two heresies as there are many names between the corporate deification of believers and individual deification of believers in the NOLR. So which version of Hick’s vision is correct? Feel free to compare the different versions available online. They are all essentially conveying the same vision, some more abridged than others for brevity’s sake. Thanks to Michael Brown endorsing a book titlted ‘The Rising Revival’, (written by NAR Apostles back in 1998), we stumbled upon more information regarding Tommy Hicks. His entire ministry in Argentina only confirmed that no Christian can separate the New Order of the Latter Rain (NOLR) from the Charismatic Renewal Movement (CRM) and the New Apostolic Reformation (NAR). They are as one with their false doctrine, only emphasizing slight differences. What is more disturbing about this book is that Brown’s endorsement of Wagner and these New Apostolic Reformation Apostles reveal that the spirit behind Lakeland (2008), Brownsville (1995) , the Toronto Blessing (1994), Holy Trinity Brompton Revival in England (1994) and Lakeland (1993) can be traced not just back to the Argentine revival back in 1982. It can be traced back to the Latter Rain itself with Tommy Hicks coming down to Argentina in 1954. These men would rise to NARpostolic prominence thirty years later, corrupting and overrunning denominations under the guise of Pentecostalism (or other false names) in Argentina. The same pattern of deception of the NOLR/CRM/NAR in Canada, New Zealand, Australia, South Korea and even in Argentina are the same. The NOLR/CRM/NAR refuse to engage in honesty in any fashion and destroy churches and entire denominations. Yet after 60 years, we still treat them as though they are a legitimate strain of Christianity while they destroy entire families, churches and communities. When will we learn? NOTE: Notice that the ministry of Hicks emphasizes the “the intensity of the release of God’s power”. This is because the NOLR/CRM/NAR Power Gospel is all about healings, signs and wonders. In 1954 the minuscule evangelical church in Argentina, numbering only a few thousand, received a tremendous boost when Tommy Hicks, a relatively unknown lay preacher from California, packed first one stadium and then a larger one with multitudes eager to hear the Word and to experience the power of God. It has been reported by reliable sources that 200,000 people attended each day during the closing week of the campaign. Large numbers received the Lord and an unusually high percentage joined the many congregations that sponsored the campaign. pre-campaign state, but deep down in their hearts they knew that God was able to do something extraordinary and that, most likely, He would do it again. Juan Passuelo, Omar Cabrera and Juan Terranova were three of those leaders, and 30 years later they would be in key positions of national leadership when God chose to surprise the Church again by using another unknown lay preacher by the name of Carlos Annacondia to touch the lives of unprecedented numbers of unbelievers. Juan Terranova was the president of the National Association of Evangelical Churches. Juan Passuello was the president of the National Association of Pentecostal Churches. Omar Cabrera presided over Vision of the Future, the most dynamic evangelistic movement in the nation. God only knows how much the seed planted during the Tommy Hicks campaign influenced them to be open to the unorthodox ministry of Carlos Annacondia, especially in its uncharted beginnings. However, it is part of the public record that each of these men played key roles in affirming and confirming the ministry of Carlos Annacondia during those crucial early days. Source: Ed. 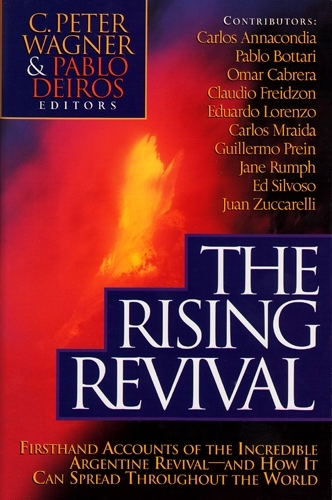 C. P. Wagner, Pablo Deiros, The Rising Revival – Firsthand Accounts of the Incredible Argentine Revival-and How It Can Spread Throughout the World, (Ventura, CA: Gospel Light, 1998), pg. 208. ‹ Documenting the evidence of the false spiritual baptism (Part 1).